Syria Daily: US & Russia Close to Deal on 48-Hour Aleppo Ceasefire? Residents of Qumhana fled to Hama. Rebel sources from Hama city report that Qumhana Shabihas are now at the Roundabout of Aleppo-Hama road. ORIGINAL ENTRY: The US and Russia are close to a deal for a 48-hour ceasefire in Aleppo city, ensuring UN humanitarian aid, according to “diplomatic sources”. However, the sources also said that key elements are still being discussed and that US Defense Secretary Ash Carter and Syrian opposition groups, are likely to have doubts. The deal could also lead to US intelligence sharing with Russia on targeting of the jihadists of Jabhat Fatah al-Sham, formerly known as Jabhat al-Nusra. inspect cargoes or to remove their contents. The Syrian opposition and rebels have objected that access solely via al-Castello would only ensure assistance to regime-held parts of Aleppo and would effectively keep opposition areas hostage — the goal of the Assad regime and Russia when they cut off the route last month. The opposition and rebels want any plan to allow aid through the Ramouseh road to the southwest of Aleppo. 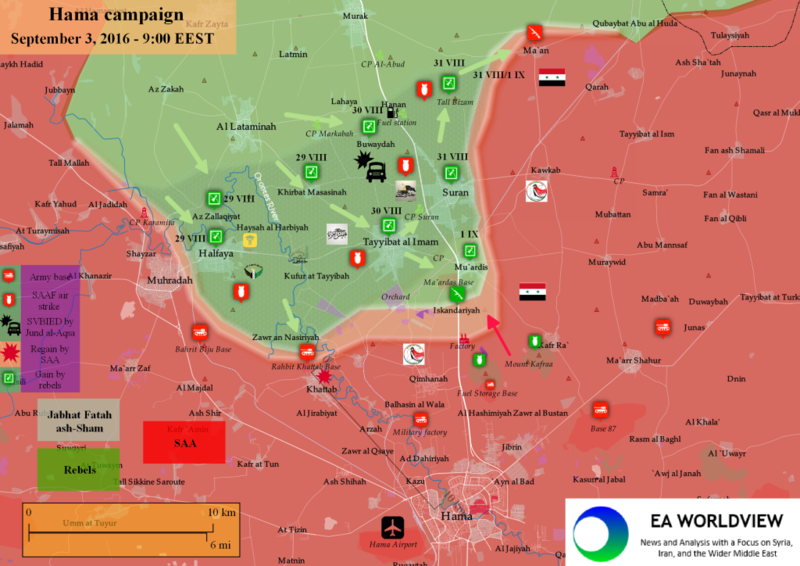 That corridor was opened in early August by a rebel offensive that took key positions and broke the month-long siege. The US-Russian proposal would also limit flights by regime aircraft to designated areas, although these have not been specified. 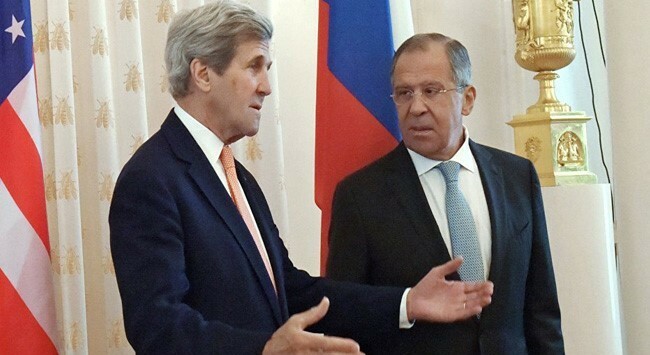 US Secretary of State John Kerry and Russian Foreign Minister failed last week in nine hours of negotiations to advance the initiative, but American and Russian officials resumed discussions this week in Geneva. Lavrov pointed to progress on Friday, while continuing pressure on the US to accept Russia’s demands for widened airstrikes against rebels as well as Jabhat Fatah al-Sham. Virtually all components of this task are already clear, an understanding has been reached on most issues. The most important thing is that any agreements with the Americans on practical actions, on coordination of operations against terrorists will not be implemented if our American partners do not keep their promise to dissociate themselves from terrorists, above all, the Jabhat al-Nusra. Many of the groups considered acceptable by the US have actually affiliated with Jabhat al-Nusra, while Jabhat al-Nusra is using them to avoid being attacked. A US agreement with Russia would likely give Moscow cover for its airstrikes since last September. Ostensibly aiming at the Islamic State and the former Jabhat al-Nusra, the large majority of the bombings have been of opposition territory — including civilian sites — and rebel positions. Rebels have captured about a dozen villages from the Islamic State in northern Aleppo Province, after Turkey opened a new front in its 10-day intervention. Turkish tanks crossed the border to help rebels near the town of Al-Rai, about 45 km west of the Turkish-rebel initial capture of Jarablus. If the offensive can close the gap between Al-Rai and Jarablus, it will secure about half of Turkey’s envisaged “safe haven” near the border. Rebels have held their advances in this week’s offensive in northern Hama Province, repelling a pro-Assad counter-attack on the village of Maardas. The rebels have taken four towns and a series of villages this week as they established the frontline across a wide section of northern Hama, threatening to cut off regime forces in Hama and Aleppo Provinces from each other. They are within 10 km (6 miles) of Hama city. However, the rebels now face daunting challenges, such as the fortified village of Ma’an and the high point of Mount Zain al-Abedine.